If you’re looking for a rustic cabin with a bit more room, then the A-Frame is the perfect fit for you. These two story cabins are perfect for a small family or a friend’s weekend getaway. 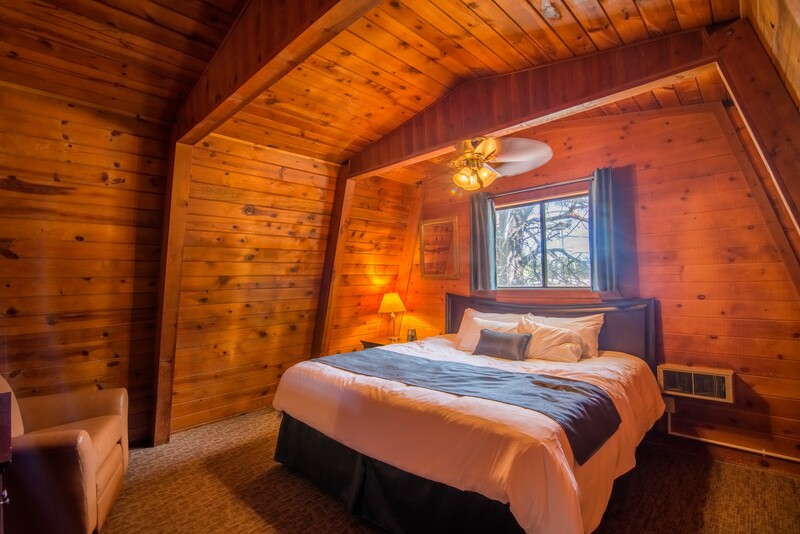 The A-Frame’s accommodate up to six people and with one bathroom. There are two separate bedrooms upstairs and a pullout couch downstairs. The first bedroom upstairs has one king bed and the second bedroom has two twin beds, while the pullout couch in the living room downstairs has a full sized mattress. In the living room is a TV with a DVD player, couch, and chair. 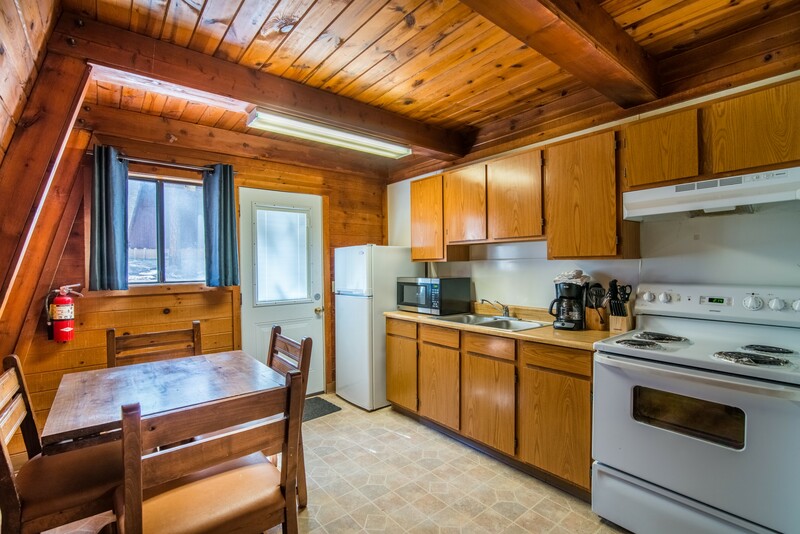 Also within the A-Frame’s is a full size kitchen that has a four-burner stove, oven, microwave, fridge, toaster, coffee pot, and kitchen table. All are equipped with kitchenware from plates, to pots and pans, utensils, and measuring cups, there’s nothing that won’t hold you back from making a delicious meal for up to six people. Outback has a small porch, charcoal grill, and picnic table. If you’re worried about staying warm during the winter seasons, there’s no need because every unit has its own central heating system. Set up similarly to our A-Frames, the Multi-Family A-Frame is perfect for a large family vacation or weekend gathering with friends. This two story house can accommodate up to 12 people and has two full sized bathrooms. Upstairs has three separate bedrooms and two pullout couches downstairs. The first two bedrooms have one king sized bed. The third bedroom has one twin bed and one bunk bed with a full sized bed on the bottom and a twin bed on the top. Both pullout couches, each having a full sized mattress, is located in the living room with a TV and DVD player. Next to the living room is the family room, equipped with more seating for all of your guests. 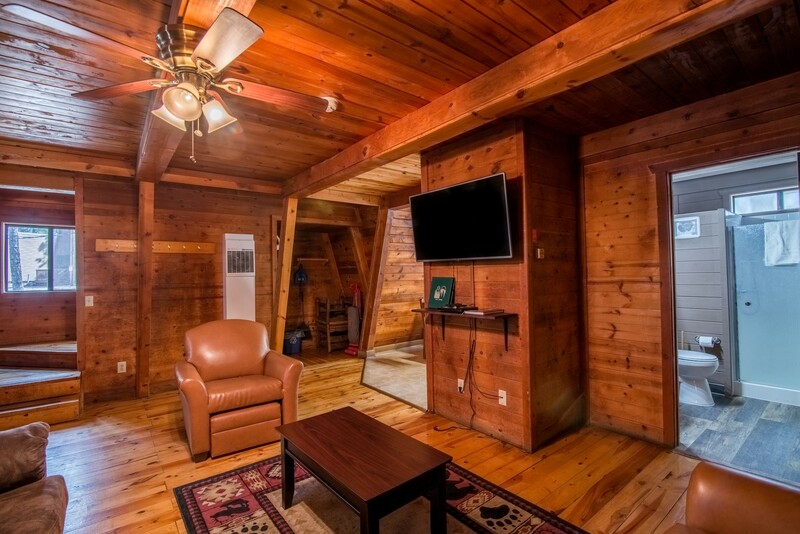 Similar to the A-Frame kitchens, the Multi-Family has a four burner stove, oven, large refrigerator, family sized kitchen table, pantry, microwave, toaster, coffee pot, dishwasher, and also has its own set of washer and dryer. The kitchen is also equipped with all of the kitchenware you would need to make a great family meal. Out front is a large front deck that wraps around the side of the Multi-Family and is equipped with a picnic table. While outback, the Multi-Family has its own fenced in backyard, with two charcoal grills, and its own personal fire ring. Cozy like a house, our Multi-Family A-Frame is perfect for any large gathering. Almost identical to our regular A-Frame’s, A-Frame is the perfect fit for your small family and pets! The pet friendly A-Frame can still accommodate up to six people, but it can also accommodate your furry friends as well. We have two pet-friendly A-Frame with a pet fee; $25 for the first night, $10 for each additional. Our pet friendly A-Frame is still equipped with all of the same amenities as our others; however the layout is a bit different. Upstairs is loft style, where the two twin beds are only separated by a wall from the one king bed, instead of a door. The kitchen and living room identical to a regular A-frame; however we also include a kennel that will keep your pets secure. Contact our reservation desk at 928-774-8893 to book your pet friendly accomidation today! The Multi-Family A-Frame has a 2 night minimum.